Colleagues seated from left: Wendy Humphrey, Jim Gardner, Brad Kent, Lori Diecidue and Kay Eaton. 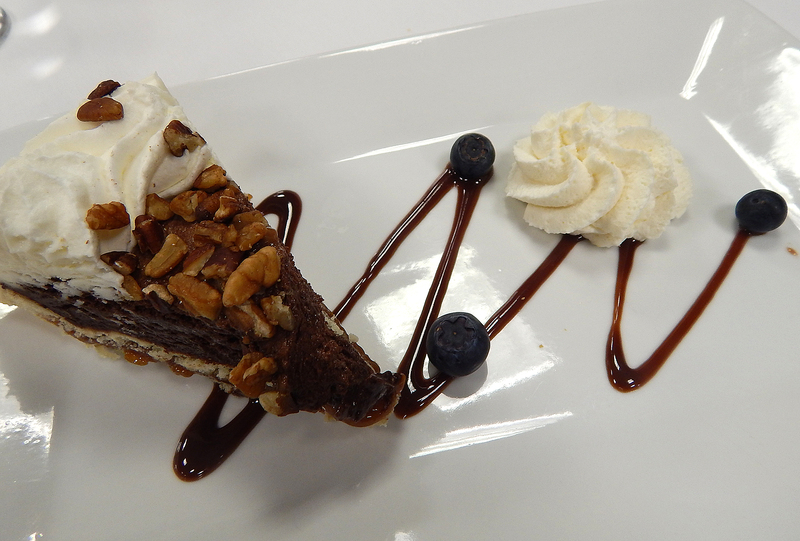 —A nice perk here at the college, our Hotel, Restaurant and Institution Management (HRIM) program offers several dining experiences for faculty, staff and the community each Fall and Spring semester. 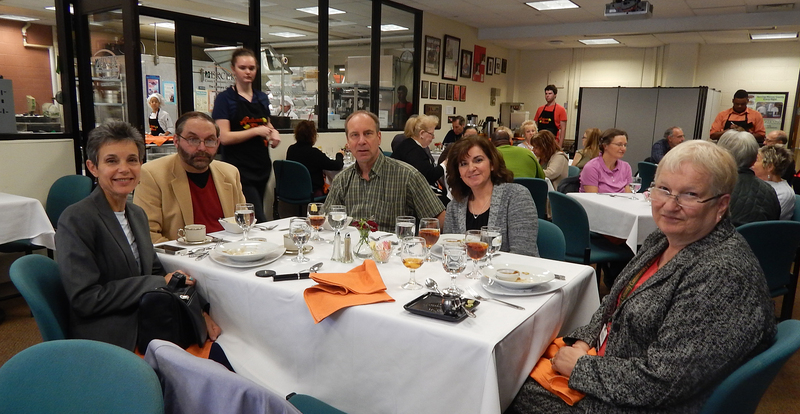 One of the offerings this Fall was the aptly named “Autumn Blend.” For only $10, each Wednesday, this lunch class—which had also designed the menu selections—prepared and served the meals. Having attended many of these in the past, six of us from the College Advancement department wasted no time in procuring tickets for another delicious meal. The Hotel, Restaurant and Institution Management program prepares students for employment in various entry-level management careers in the food service and lodging industries. Areas of employment include assistant manager in hotel/motel operations; club, restaurant or banquet manager of commercial eating establishments; and assistant food service management positions in hospitals, schools and other institutions. Upon completion of the program, the successful graduate will be awarded an Associate in Applied Science degree. 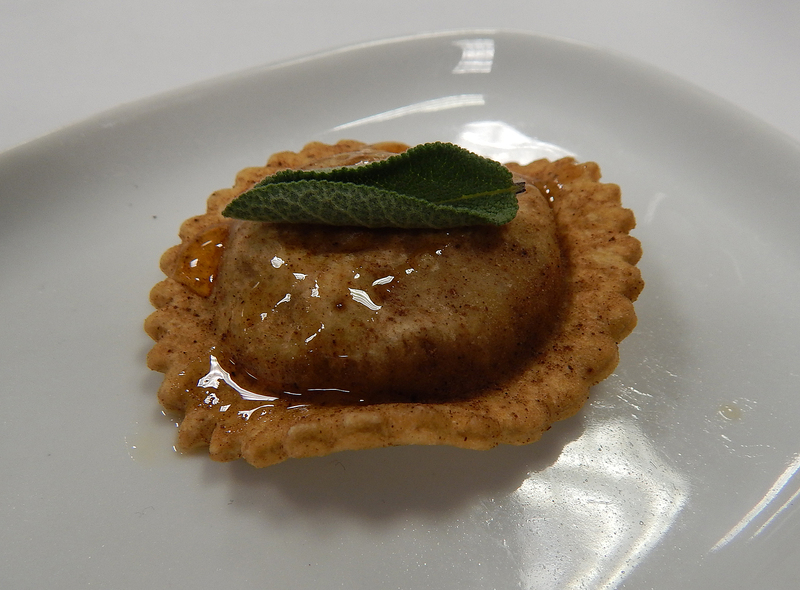 When first seated, we were presented with an “Amuse Bouche,” of Fried Pumpkin Ravioli which was a sweet creamy mixture of fresh pumpkin, parmigiano reggiano cheese, brown sugar wrapped in homemade ravioli, fried to a golden brown and topped with a fried sage leaf. Most at our table agreed the exterior was a bit too tough requiring a knife to cut, but the interior was pleasantly spiced and creamy, albeit a bit sweet. What was not so smooth? In a nut shell, service. Four out of six were practically done eating our appetizers when we had to nudge a waiter to question the whereabouts of two orders of Smoked Corn & Bacon Chowder. (We have to keep in mind, these are students who are just learning the ropes, not seasoned professionals!) 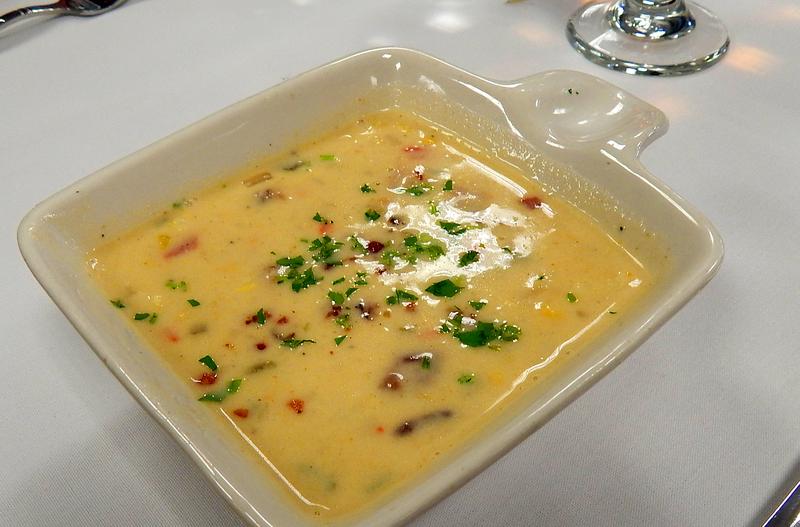 Within moments the chowder arrived and to the delight of the recipients, it was a total success! 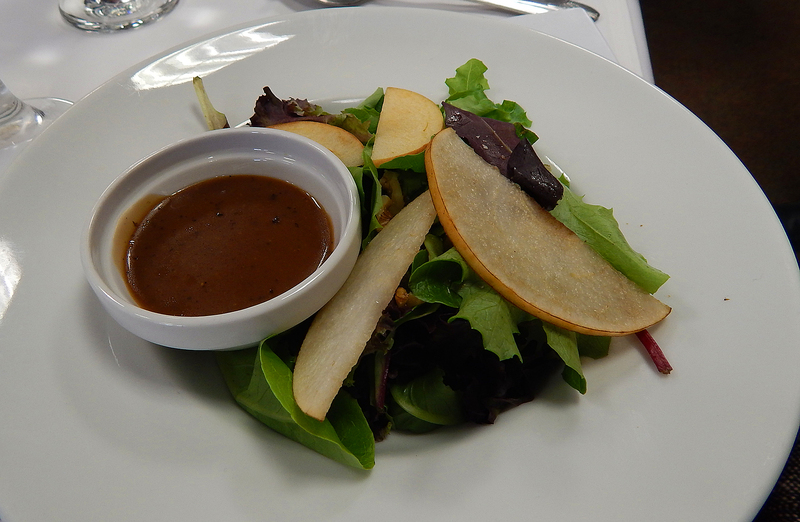 Three staff ordered the Pear Apple Salad consisting of mixed leafy greens topped with local autumn apples, Asian pears and walnuts served with a delicious balsamic vinaigrette, which they all liked. 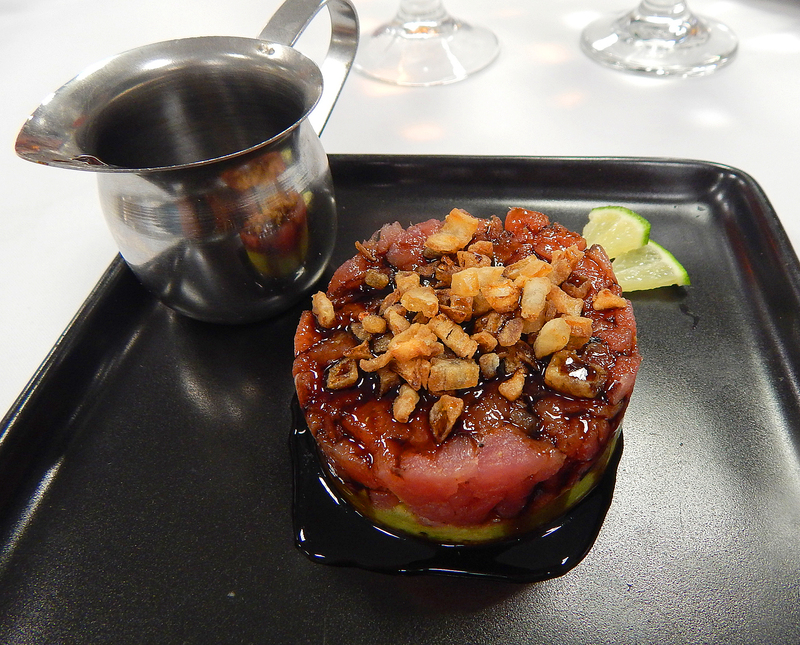 I alone ordered the Tuna Tartare, and was blown away both in presentation and in flavor. It was presented as a small circular tower of sashimi grade tuna and avocado with micro greens. The plate also contained a mini container with a savory sauce to pour over the tower. Two tiny wedges of lime completed the dish. Perfecto! Duck Quesadillas, tender pieces of duck confit with caramelized onion, mango, poblano chili’s, fresh cilantro and jack cheese in a crispy tortilla, sounded extraordinary, but no one in our party ordered it. Next up, the entrees. 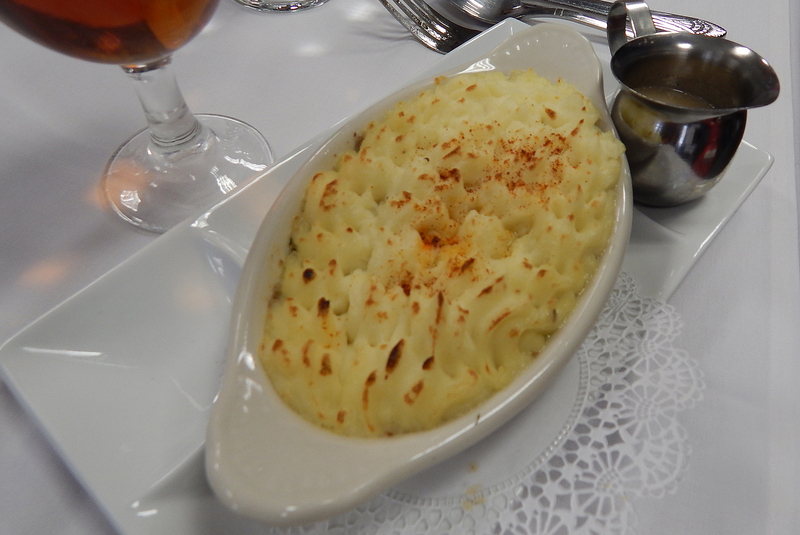 Of five choices, two people ordered the Turkey Sheperd’s Pie topped with a mash of Yukon Gold potatoes. 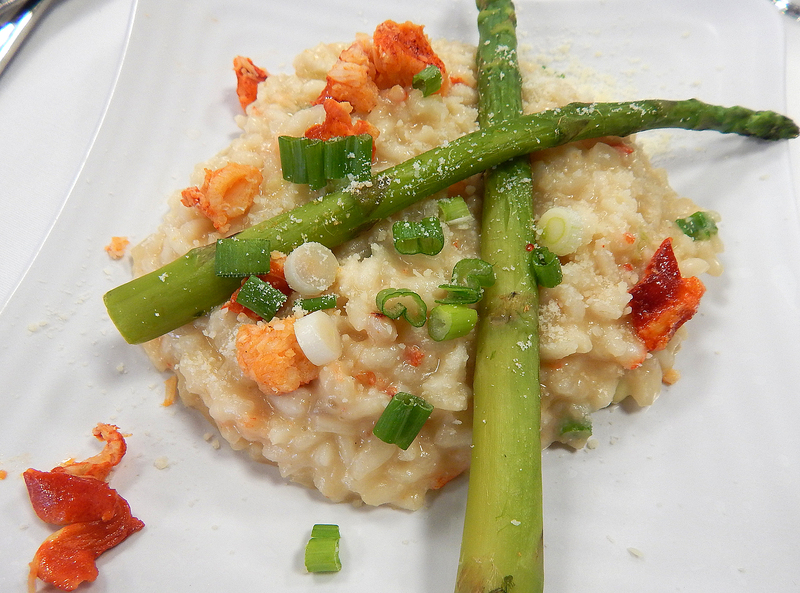 Another three (myself included) opted for the Lobster Risotto, with pieces of lobster atop Arborio rice and brown butter served with grilled asparagus. While nicely plated and tasty, it didn’t pack as much of a flavor punch as my Tuna Tartare. 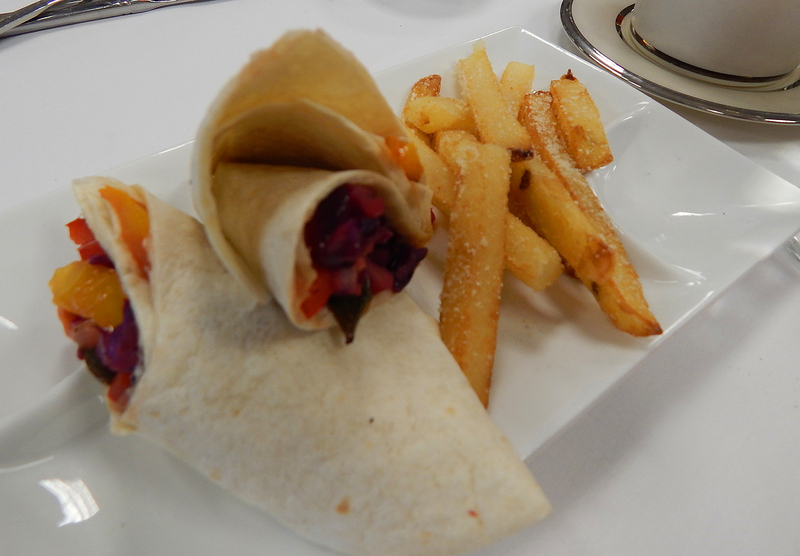 Another guest chose the Grilled Vegetable Wrap with grilled yellow and red bell peppers, diced tomatoes, sliced cabbage and minced ginger wrapped in a flour tortilla served with truffle fries. In name, truffle fries sound decadent and delicious, but this order came with limp fries and underwhelmed the dining patron. Two other offerings none of us chose this time around were Beef Stew, seasoned diced sirloin browned and cooked with potatoes, carrots, peas, onion and anchovies in a full-flavored brown sauce; and the final option of Prosciutto Wrapped Pork, roasted pork tenderloins wrapped in prosciutto and served with truffle fries… perhaps another time. The menu does not list dessert choices, only “Daily Dessert Selection.” But our waitress described the options as Pumpkin Pie, Fresh Fruit Cup with or without whipped cream, and a Chocolate Mousse Pie that five out of six of us ordered. So beautifully plated, one diner claimed it was the best part of her meal! 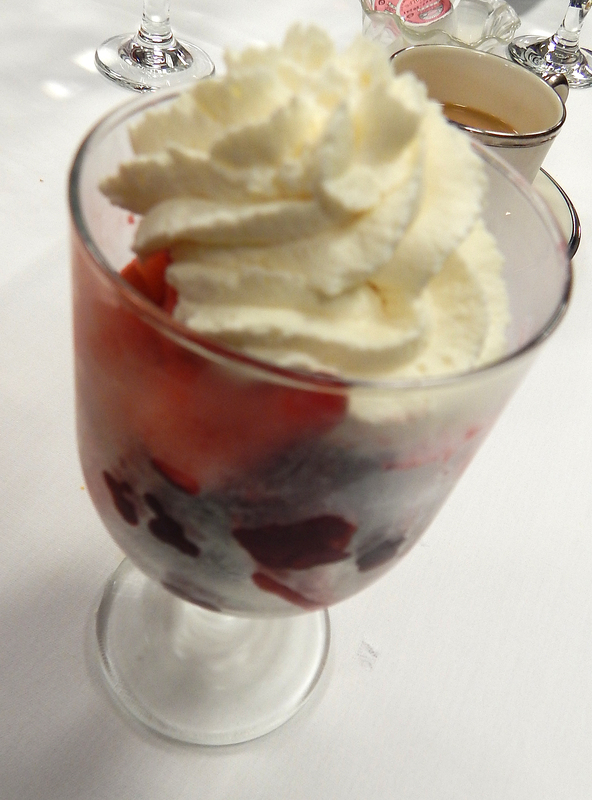 Of course, not being a dessert eater, I took mine to go knowing that husband Russ would be the lucky recipient. Thanks to my colleagues for being so very patient and indulging me as I photographed their meals!